Sealweld Professional Valve Technicians specialize in maintaining and sealing lubricated valves and actuators. In the past few years our service department personnel have helped save clients over 1 billion dollars by preventing costly shutdowns and unplanned outages. Our services department maintains Master Service Agreements with many of the world’s largest oil & gas producers, pipeline operators and distributors. We are registered on ISNetworld, Canqual and other contractor management providers. Sealweld does not sell valves or maintain a valve repair facility. Our focus in to simply help keep your valves in-line for as long as possible and to avoid costly shutdowns. Our specialty is helping you realise the full potential life span for all of your critical service valves. Sealweld Services is a world leader in emergency valve sealing. Our techniques and procedures allow technicians to inject cleaner and sealant while the valve is in-line and under pressure. We focus on manufacturing ‘temporary’ sealants that can be flushed out after the work is complete, allowing the operator to cycle the valve again if necessary. Our emergency sealants are specially designed to provide a reliable seal when required and can be used in most makes and types of lubricated valves. With our expertise, products and procedures refined over decades of field applications, you can expect to successfully seal 98% of all valve leaks. Valves are the most common mechanical device found at any plant, platform or pipeline operation and require routine maintenance to ensure they operate and seal properly every time. Well-maintained valves can potentially operate efficiently for the lifespan of the facility. Some operators make the mistake of purchasing inexpensive valves from manufacturers that market their products as ‘maintenance-free’ or ‘non-lubricated’. Although these valves are designed and constructed well, there is a fatal flaw in this logic – every valve will eventually leak. It may take many years of service but the slightest bit of contamination caught in a sealing area can cause damage to the soft surfaces on seat rings and stem seals. If there is no sealant system to inject through, the valve cannot be sealed. Operators may also be misled by the maintenance lubricant manufacturers that claim their product is the best for certain applications. There is a good rule of thumb to use when purchasing lubricants and sealants – like engine oil, synthetic is best! Conventional lubricants sometimes utilize clay powders as a thickening agent that gets left behind when the carrier product has washed away. Depending on the operating conditions, this clay can harden into material as strong as concrete. A small investment into a strong preventative maintenance program will ensure many years of trouble-free service which will save you a lot of lost production time and repair cost. A pressurized pipeline is an extremely dangerous environment to perform valve maintenance around. 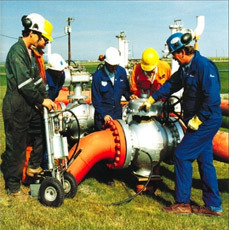 Experienced valve technicians are trained to fear and respect the extreme pressures associated with pipeline operations. Skilled technicians use on-line pressure to their advantage when diagnosing and resolving leaks. Sealweld Services has invested a lot into analysing and understanding various components and design features of lubricated valves. As a result, we’ve been able to determine how leaks form and the best practice to seal them. Our technicians have specialized in servicing valves in-line and under pressure for over 40 years and are recognised as the best in the world. Valves that have been in service for a long time, or in extreme service conditions, must be serviced or refurbished regularly. Often times, it’s possible to make these repairs and upgrades while the valve is in-line and under pressure. Actuator and gearbox repairs can sometimes be made without impacting production at all. In recent years, Sealweld Services personnel have been working hard to accumulate reference material and field experience on large power actuators and repair procedures. We constantly work with our US and International offices to build a cohesive program so we can deliver these procedures to our clients through comprehensive training. These procedures will become part of our ValvePro Training Program in the future. Contact a Sealweld representative for more information on the valve and actuator repairing services we offer. From the planning phase to decommissioning and everything in between, Sealweld Services provides all types of valve maintenance consulting services. Using our expertise when planning and commissioning your pipeline project will guarantee a smooth and problem free start-up with no valve leaks. We’ll help you choose the proper valves, materials and fittings to suit any situation. Dozens of studies on valve commissioning show that the long-term economic benefits far outweigh the initial investment. Our representatives can show you, step by step, how to implement the right commissioning program for your project. After start-up, we can also build a preventative maintenance schedule for your pipeline or plant to assure your valves will always work properly. And, after many decades, when your valves have surpassed their service life expectancy, Sealweld Services will help you plan your decommissioning project. Sealweld has over 30 years of experience in the pipeline valve maintenance industry. As a result, we’ve amassed a lot of valuable information and developed some of the most effective procedures to keep your operation producing safely and efficiently. The biggest way to achieve this is by commissioning your new valves during the construction phase of your pipeline or facility project. Every study on pipeline leakage shows that the vast majority of valve seal damage occurs during construction, hydro-testing and start-up. We have developed specific techniques and procedures designed to save your valves from the most common types of seal damage. Our service division personnel are always available for a consultation. Contact us before the construction process begins for a complete commissioning strategy that will assure a smooth and safe start-up. It may sometimes be difficult to identify the right kind of valve for the right application. Often times an operator will select a small diameter ball valve as a throttling valve where a metal-seated plug valve would be much more appropriate. How do you decide what kind of mainline block valve will work best for crude versus dry natural gas or what the best wellhead gate valve for a SAGD operation is? Choosing the proper equipment for your project is key to maintaining optimum and safe production. This will, in turn, save you from unplanned outages due to valve repair or replacement. Don’t leave an important decision like this to chance. Contact our services division for information on valve selection and commissioning for any pipeline or facility construction project. Wellhead servicing is, by far, the most dynamic and difficult kind of valve maintenance and repair work. Production wells extract the rawest form of fossil fuels, often mixed with acids, poisonous gases and harsh abrasives. As a result, wellhead valves can be easily damaged and require aggressive fitting upgrades and specialized sealing agents. Don’t risk contracting a service company with less experience when safety and production are at risk. Whether you’re servicing conventional wells or high temperature steam injection wells, Sealweld Services has specialized in wellhead valve servicing for decades and use field-tested techniques to keep you producing safely.